Is there a specific result they delivered in this position? Be specific about why you are recommending the individual (1 sentence). What qualities make him or her most valuable? Emphasize what the person did that set him or her apart. What is his work style? Does she have a defining characteristic? To be effective, Recommendations should focus on specific qualifications. Tell a story (3-5 sentences). Back up your Recommendation with a specific example. Your Recommendation should demonstrate that you know the person well — so tell a story that only you could tell. And provide “social proof” in the story — give scope and scale for the accomplishments. Don’t just say the individual you’re recommending led the team — say he led a 5-person team, or a 22-person team. Supporting evidence — numbers, percentages, and dollar figures — lends detail and credibility to your story. End with a “call to action” (1 sentence). Finish with the statement “I recommend (name)” and the reason why you would recommend him or her. Challenge: What was the context for the work situation on the project? What was the problem that the project was designed to tackle? Action: What did the person you’re recommending do? What was their specific contribution? Result: What was the outcome of the project — and can you quantify it? 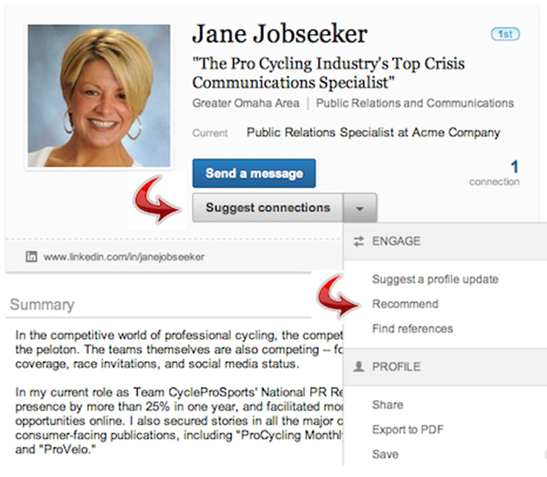 You can use LinkedIn’s “Advanced People Search” function to conduct a search. At the top right-hand side of the page, click the “Advanced” link next to the People search box. 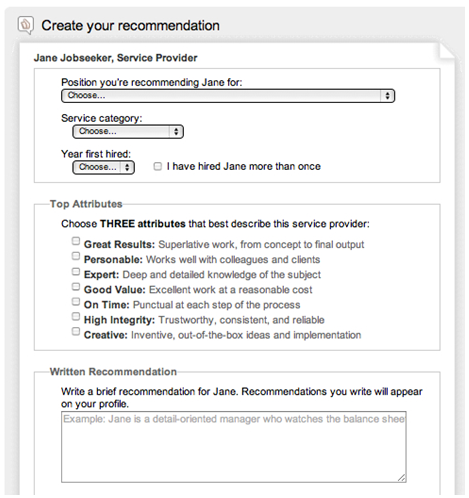 You can enter in keywords or job titles to find profiles related to the type of Recommendation you are writing. You can then browse the listings that come up as matches and check out the Recommendations on those profiles. Consider drafting your Recommendation in Microsoft Word or a text editor. Because LinkedIn does not have a built-in spell check function, this will help ensure your text does not contain spelling errors. You can also check your grammar in Microsoft Word, and use the “Word Count” feature to determine the length of your Recommendation. 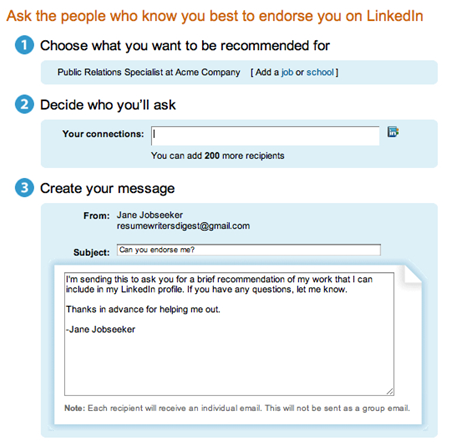 Now you’re ready to actually create the Recommendation in LinkedIn. This will take you to a separate screen where you can manage the Recommendations you’ve received and make a Recommendation. 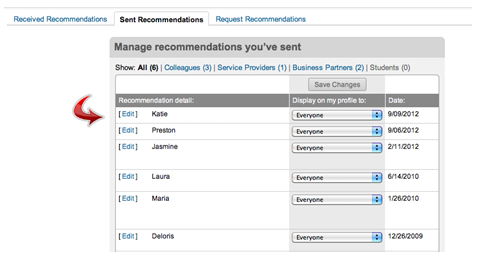 You will also see tabs on this page where you can view your Sent Recommendations and Request Recommendations. Student (they were at the school when you were there, either as a fellow student or as a teacher). Once you’ve selected an option, choose “Go.” You’ll be taken to a page where you can create the Recommendation. 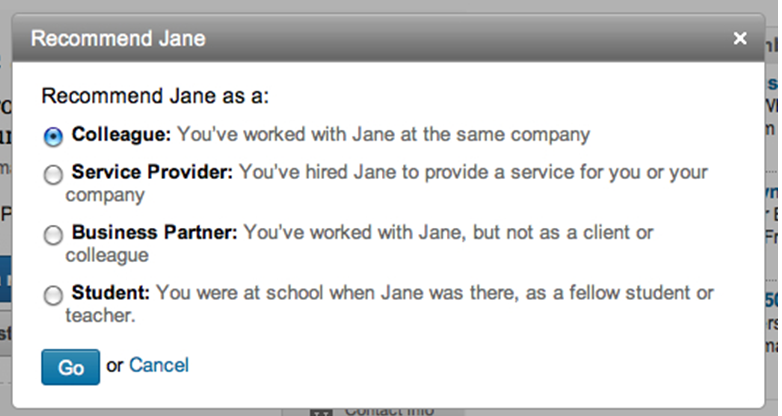 You’ll be asked how you know you know the person and can select the job or school you were at during that time. Paste in the Recommendation text you created in the first section of this report. 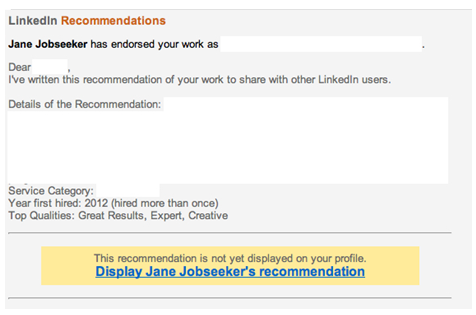 The person you recommend will get your email notifying him or her that you’ve made a Recommendation. If you don’t receive a reply from the individual you’ve recommended within a week, follow up and make sure they received it. Keep in mind that you can change (or remove) Recommendations you’ve given. 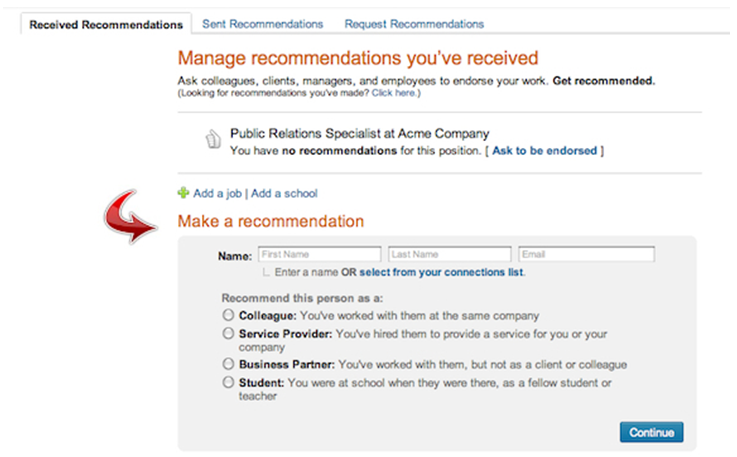 If you want to edit or remove a Recommendation you’ve written, click on the [Edit] button next to the person’s name. 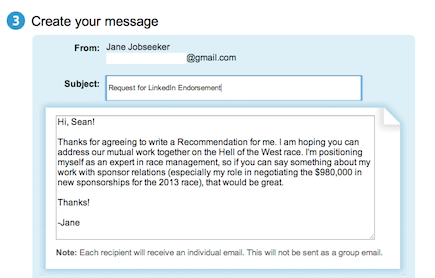 Any Recommendation you write may show up in your Activity feed on LinkedIn — even before it’s approved by the individual you’ve recommended — so keep that in mind. 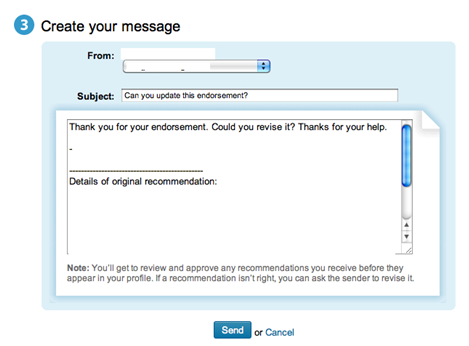 To ask for a Recommendation, LinkedIn has a Recommendation request form. An even better idea is to ask for the Recommendation through more personal means — for example, in person, on the telephone, or via email. However, if you do decide to write a Recommendation, the first question you should ask is: “What is the goal?” Does the individual want a new job? A promotion? Make a career change? Land a client? Knowing what their goal is in soliciting a Recommendation will help you tailor it to meet their needs. Look at the individual’s LinkedIn profile — especially the job description of the position when you worked together. If you are asked to provide a Recommendation, it’s fine to ask the person to draft their Recommendation for you to work from. Remember, Recommendations you write show up on your profile too, so someone looking at your profile can see the Recommendations you’ve made for others. The best way to handle a Recommendation that you don’t like is simply to ask for it to be changed. But instead of asking them to change the whole thing, address specific issues in the Recommendation that you would like changed. Replace the standard text in the message with your custom message. What If You Change Your Mind About Displaying a Recommendation? 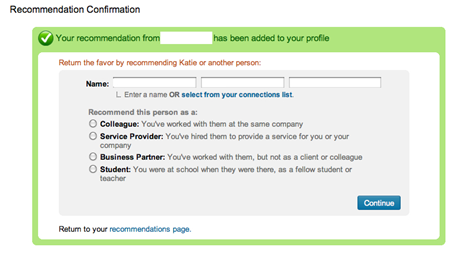 You can also choose to remove Recommendations from your profile, even after they’ve been published. 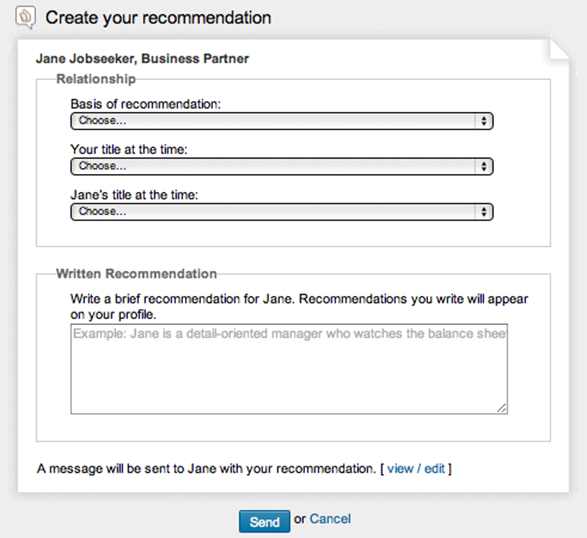 Here is how to manage the Recommendations already on your LinkedIn profile. Choose “Recommendations” from the Profile menu. In the section below that heading, you’ll see a list of your current positions and any Recommendations you’ve received, associated with each job position you’ve listed in your profile. You can also request a new or revised Recommendation on this page. Then, click “Accept Recommendation.” This will acknowledge receipt of the Recommendation, but it will not be visible on your LinkedIn profile.